Tweet Leaving Eden has played with some pretty big name bands and it’s only a matter of time before they’re one of those big names themselves. They’ve shared the stage with Black Sabbath, Korn, Shinedown, Sevendust, 10 Years, Papa Roach, Collective Soul, and Drop Kick Murphies. The list is over 50 bands long; needless to say they’re on the verge. Recently I got the chance to chat with their guitarist/sometimes singer Eric. A - It’s rock n roll, it’s heavy and we do acoustic stuff as well, we try to mix it up and be outside the box a little in terms of styles. Q - What’s your band’s song writing process? A - Musically I write…sometimes I write lyrics first sometimes I write music first, it depends. Sometimes they come at the same time as well. Q - Who was the one person or act that made you want to be a performer? A - Actually I’d have to say Black Sabbath. We got to play with Black Sabbath too, so that was cool. Q - Who are some of the bands you’re into now? A - I like the Foo Fighters, I like Papa Roach, Shinedown…you’re talking about newer ones right? A - I like Seether, obviously Halestorm and Flyleaf, they got some girl singers which is pretty cool, Disturbed. Q - What are your touring plans? A - Right now…we’ve been touring, we just got back from Europe, we just played with Bret Michaels and we just played with Sevendust and 10 Years. We’re going to be playing with Powermann 5000 and we have a bunch of stuff that is being lined up right now. A - I think the biggest thing is the amount of energy transferred. Our message is clear, live life have fun. I think the amount of energy, you know the movement on stage and the sound we generate musically, it’s a three piece and I sing and she sings. We have to fill it up with three people because there’s nobody else. We’ve got to keep it solid and keep it rocking. Q - What are some of your stand out performances? A - There are a lot of them. Usually when we play on the huge stages when there is like 20,000 people there, for instance when we played with Black Sabbath, was huge. Disturbed, that was great. We just played with Shinedown, it was huge and a great show. The sound, that’s what sticks out for me is the sound that we get from that. Just the amount of people it’s a massive amount of energy. Q - What are some of your pre show rituals? A - Good question (laughs), we like to chill out. We usually do a prayer just to make sure things go good and try to relax a little bit. Q - Have you had any embarrassing on stage moments? A - Yes, when we were in Europe, we didn’t have our own equipment, so we had to use other equipment that was there. The guitar I had…they don’t really have a lot of Gibson’s over there, so I had to take what I could get. I got one of those guitars that was see through. The strap kept breaking, I got these strap locks, they kept breaking, because we move so much, that energy. When I’d jump up and down I’d have to play the song on my knees or lying down until the song was over because I had no choice and I don’t like to stop in the middle. It ended up being a good thing, because people would come up to me and be like, ‘wow I’ll never forget that. 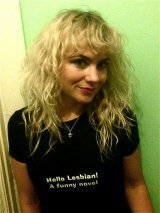 That just made my day.’ It ended up being cool, but it ended up being embarrassing at the time. Q - With the business side of the music business being as chaotic as it is, what keeps you going/interested in playing music? A - Another good question, I would think intrinsic motivation comes with it. If somebody is truly a musician by heart, than they should only be sleeping, eating and breathing music. That’s what they should be doing for a living. Like anything that you love, you keep going because you keep creating new material and new songs. Each one just keeps you going to the next. I think in any profession, if you’re doing what you love, you keep doing it until the day you die. Q - You’ve played with a lot of big name bands, who are some of the bands you’ve shared the stage with? A - There’s well over fifty, but let’s see, Black Sabbath, Disturbed, Shinedown, Theory of a Dead Man, Halestorm, Bret Michaels, Collective Soul, Sevendust, Papa Roach, Alice in Chains, Alice Cooper, Queensryche, Mudvayne down in Florida, yeah…I think that’s enough. Q - Thanks for taking the time to talk with us. 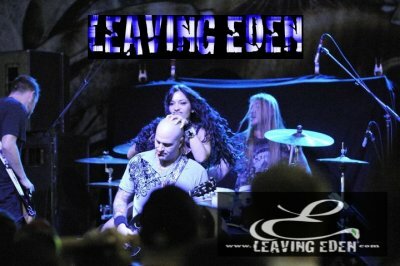 Check out Leaving Eden at http://www.leavingeden.com/.